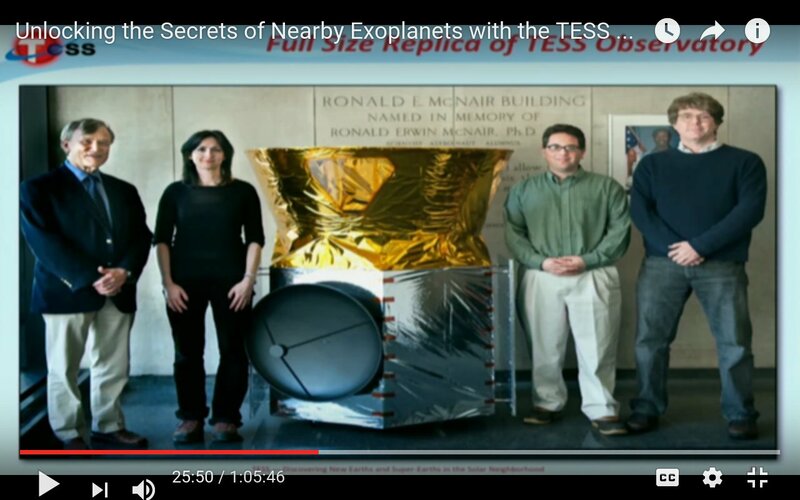 This is a SETI video on TESS. It includes immediately after this at 26 minutes or so a short discussion of the launcher, along with some shots of TESS structural fit testing on a F9 mockup. And a ridiculous to-scale in the fairing image. At about 1:01, there is a discussion of the original designs, and the plans for launching on the orbital sciences Taurus/Minotaur-C which has a maximum payload to LEO of 1350kg but by the time the vehicle got picked, it was too late to optimise. F9 was the lowest bidder..
Other notable facts - it ends up in its final 14 day orbit which is metastable, and the anticipation is that they need 50 or so grams of fuel a year to do desaturations. It has 20kg of fuel remaining of the 40kg initial hydrazine, and no other consumables. "Launch around the end of 2017, maybe a bit later" - which is consistent with above in thread. At #ExoPAG mtg, NASA’s Martin Still says TESS exoplanet mission on track, but Dec. launch on F9 could slip due to SpaceX schedule issues. No surprise there, middle of the previously stated December to June window. Hertz adds TESS launch on a Falcon 9 slipped from December 2017 to March 2018 because of NASA launch vehicle certification delays. "... F9 could slip due to SpaceX schedule issues." "After review of the SpaceX Falcon 9 launch vehicle certification schedule & anomaly recovery @NASA_TESS launch date has moved .."
"...because of NASA launch vehicle certification delays." And a ridiculous to-scale in the fairing image. Based on the small size of this payload, I assume this is RTLS? Has that been announced? TESS is 350 kg - so yes. Very RTLS. The final orbit is a bit unique, which may not be very useful to other spacecraft. Just for the record - the alternatives considered were Athena-2c or Taurus-3210, both with additional Star-37FM, an Antares with kick-motor or the unmodified, but somewhat oversized Falcon-9. Interesting, I did not know Antares was certified to carry a Class B (I think?) payload. Or was anticipated to be certified to do that. AFAIK, Antares was anticipated to be certified to do that. A look inside the @NASA_TESS spacecraft @OrbitalATK; @NASA's next #exoplanet hunter! Out of the launch alternatives, the Falcon 9 was the low bid for the TESS mission. No wonder LockMart shelf the Athena. Since it appears to be non-competitive. Think it will get worst for the small sat launch providers, now that the "flight proven" Falcon 9 enters the picture. According to NASA officials, several launch vehicle related issues led to the delay in TESS’s planned launch date. First, SpaceX required additional time to certify its upgraded Falcon 9 through NASA’s Launch Services Program since it will be the first time that NASA will use this version of the vehicle. The certification process includes criteria, such as having six successful launches. In addition, SpaceX needed time to investigate and resolve an anomaly that caused a September 2016 launch mishap. NASA has renegotiated its launch contract with SpaceX to account for these delays. SpaceX continues to upgrade the Falcon 9 and, as part of the negotiation process, NASA gained the right not to be the first launch on the planned Block 5 version of the vehicle. Hopefully Block 5 will be flying before TESS anyway. I assume it can fly on Block 5 if that version of the rocket has some successful launches by then. The spacecraft team @OrbitalATK checks out the installation of one of the two solar arrays that will provide power to @NASA's @NASA_TESS. The TESS team thinks there will be a 10 percent cut in terms of the number of planets that they expect to be able to detect. Despite the reduction, Boss said TESS scientists believe they will still be able to meet the mission’s primary science requirements, and thus there is no need to fix the cameras.